Ocular trauma is a worldwide cause of visual morbidity, a significant proportion of which occurs in the workplace and includes a spectrum of simple ocular surface foreign bodies (FBs)/minute corneal abrasions to devastating perforating injuries causing blindness. , The significance of the problem is compounded by the fact that most of these injuries are preventable, thus making it a social and medical concern. Management of ocular trauma and visual rehabilitation is different in different scenario. To study: (1) The profile of ocular trauma at a hospital caters exclusively to factory employees and their relatives, particularly in garments and grinding factories. (2) To correlate the demographic and clinical profile and to identify the risk factors. 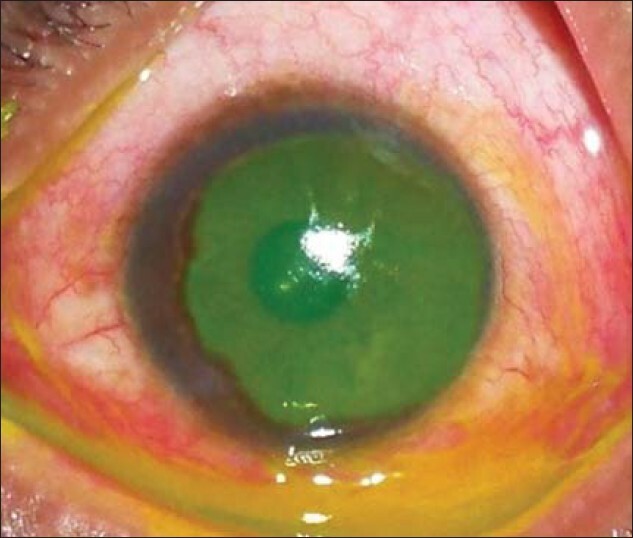 A prospective case series study of ocular trauma was done from June 2010-May 2010. Patients of all ages and both genders with various levels of ocular injuries were included while severe local and systemic conditions which would alter the outcome of vision like infection, anemia, head injury, immune compromised status, with preexisting diseases like glaucoma, operated eyes (injury to previously operated eyes), proliferative vitreoretinopathy of diabetes mellitus, hypertension, Eales and so on were excluded. A total of 306 patients with ocular trauma, presented at eye outpatient department and emergency services in the ESIC Model Hospital, Rajajinagar, Bangalore, from June 2010 to May 2011 were included. Institutional ethical committee approval was obtained. A special protocol designed to note demographic data, nature and cause of injury, time interval between the time of injury, and presentation along with any treatment received were recorded. Ocular evaluation including visual acuity, anterior and posterior segment findings (lid or facial injury, subconjunctival hemorrhage or laceration, presence or absence of corneal/scleral perforation, hyphaema, iris injuries and afferent pupillary defect, presence or absence of vitreous hemorrhage, retinal detachment or foreign body, endophthalmitis, retinal breaks, choroidal rupture, and/or macular hole), intraocular pressure and gonioscopy in closed globe injuries were done. Results of X-rays for intraocular foreign body, B-scan and computed tomography scan if done were noted. Data analyzed and classified as per the ocular trauma classification group described by Pieramici et al. The rehabilitation undertaken in the form of spectacles, contact lenses and/or intraocular surgeries was analyzed. At follow-up, the final best corrected visual acuity noted. The results showed 72.2% of ocular trauma occurred in the age category of 21-40 years and 230 (75%) cases in men versus 76 (25%) were women [Table 1]. The analysis of place of injury showed that, 155 (50.7%) were work place related while 55 (18%) were at home, 50 (16.3%) were road traffic accidents (RTAs), 36 (11.8%) other accidental, 10 (3.3%) were due to assault as depicted in [Table 2]. Of chemical injuries, 6 (75%) occurred at work place and 2 (25%) in domestic place [Table 3]. The time interval between trauma and patient presentation is shown in [Table 4]. The work place injuries presented within 3 days in 152 (98.1%) cases, while non-EI injuries presented beyond 3 days in 94 (62.2%). At work place, 79 (50.9%) were wearing protective glasses at the time injury, 42 (27.1%) were not wearing, and 34 (21.9%) were not aware of protective glasses [Table 5]. Medical line of treatment was the main stay in 252 (82.4%), anterior segment surgeries like cataract surgeries, amniotic membrane transplantation (AMT), lid and adnexal surgeries were done in 45 (14.5%), and posterior segment surgeries like pars plana vitrectomy, lens aspiration, RD surgeries, and so on were done in nine (2.9%) cases [Table 6]. Final visual outcome from presentation to post treatment at available follow-up showed that 166 (54.2%) were in good vision (more than or equal to 6/12) in pretreatment phase, while it was 205 (66.9%) in post treatment phase and 62 (20.1%) cases who had poor vision (<6/60) in pretreatment phase were reduced to 34 (11%) with treatment as shown in [Table 7]. 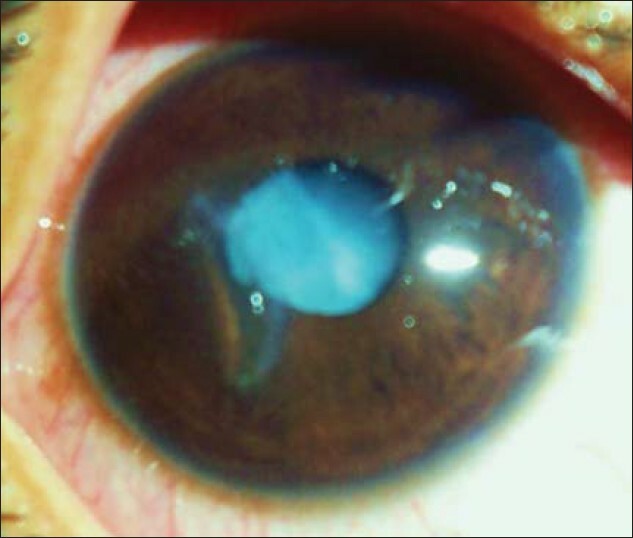 Ocular trauma is an important cause of blindness and ocular morbidity. 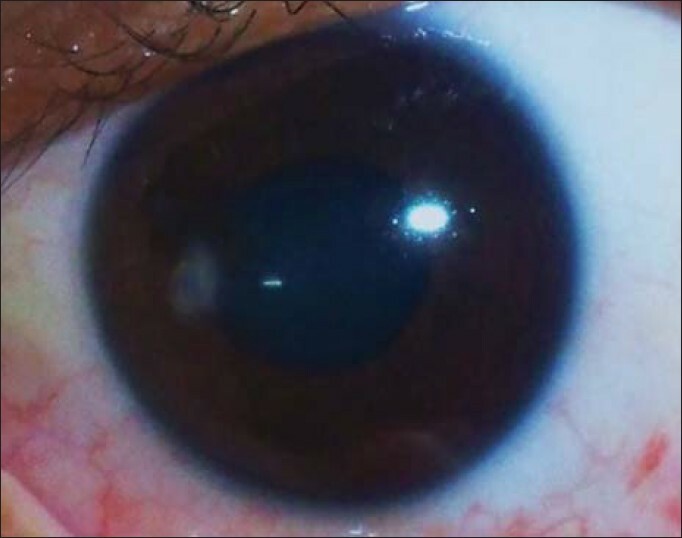 The common age for ocular trauma in this study was found to be 21-40 years (72.2%) and is similar to a prospective study by Shukla and Verma  involving 400 patients who showed that the commonest age group of people involved was in the third decade. A study done in Baluchistan by Qureshi  also showed similar age group involvement (21-30 years). The present study having been done in a hospital catering exclusively to factory employees (manufacturing units like garments, grinding, and so on) and their families showed higher incidence of work place-related ocular trauma. Closed globe injuries were 54.7% from work place in our study which is comparable to Karaman et al.,  study in his retrospective analyses of 383 patients in general population found 67.3% closed globe. RTA cases reported with a delay due to involvement of other systems, while isolated ocular trauma cases at work place reported within 6 hours in 64 (41.3%). Ocular injuries are usually not given priority if it is accompanied with multiple system injuries. After identifying major organ injury and stabilizing the general condition of the patient, ocular injuries should be given preference to simple fractures, because visual loss can be a great morbidity if neglected for the patient once he recovers from the minor ailment. The present study showed that only 51% were wearing protective glasses, while 27% were not wearing though, they were provided with and 22% were not aware of protective glasses. Ocular injuries at work are preventable and are attributable to the misuse or nonuse of protective eyewear. , Safety education has been highlighted by previous studies as they have reported worker noncompliance with personal protective equipment with up to half of workers not complying with health and safety regulations. , To meet these requirements and to reduce accidents, many larger companies in the construction industry use the Construction Skills Certificate Scheme to improve education and certify awareness of these issues. Though, visual outcome did improve after medical and/or surgical management, still 11% were left with poor vision. The physical disability adds to the social, emotional, and psychological impact on the overall development of an individual. Employees need to be emphasized on work safety cultures, proper training, and use of protective equipments. 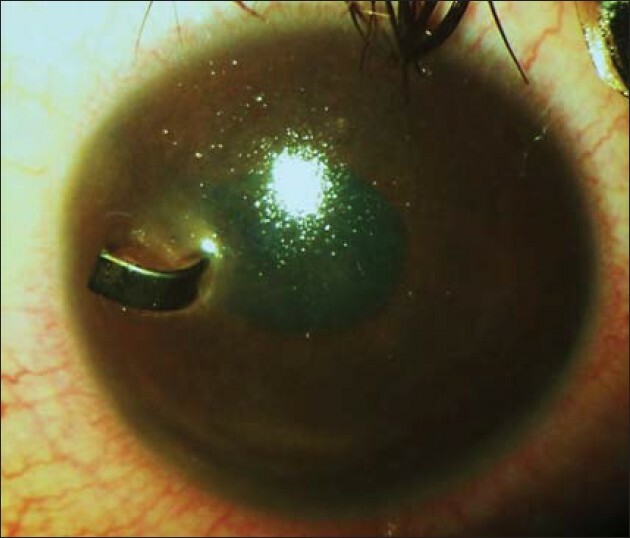 Clinicians should be referring the patients as early as possible for eye care after stabilizing general conditions or else it would be too late to restore the potential vision. Hence, we conclude that, targeting groups most at risk, increasing worker training, providing effective eye protection, and developing workplace safety cultures may together reduce occupational eye injuries. 1. Desai P, MacEwen CJ, Baines P, Minassian DC. 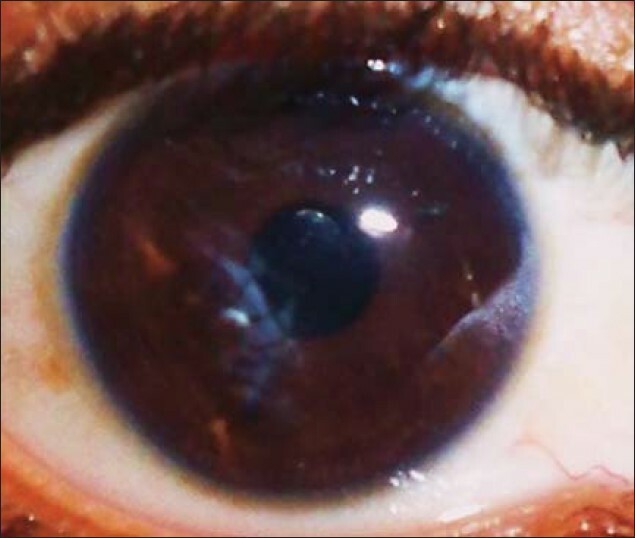 Incidence of cases of ocular trauma admitted to hospital and incidence of blinding outcome. Br J Ophthalmol 1996;80:592-6. 2. Ngo CS, Leo SW. Industrial accident-related ocular emergencies in a tertiary hospital in Singapore. Singapore Med J 2008;49:280-5. 3. Pieramici DJ, Sternberg P Jr, Aaberg TM Sr, Bridges WZ Jr, Capone A Jr, Cardillo JA, et al. A system for classifying mechanical injuries of the eye (globe). The Ocular Trauma Classification Group. Am J Ophthalmol 1997;123:820-31. 4. Shukla IM, Verma RN. A clinical study of ocular injuries. Indian J Ophthalmol 1979;27:33-6. 5. Qureshi MB. 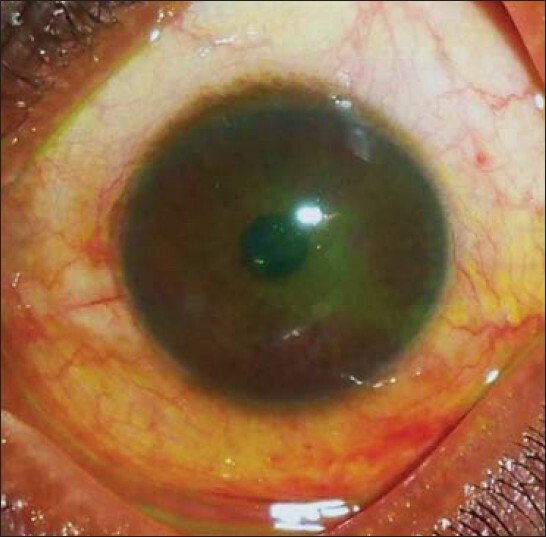 Ocular injury pattern in Turbat, Baluchistan, and Pakistan. Community Eye Health J 1997;10:57-8. 6. Schein OD, Hibberd PL, Shingleton BJ, Kunzweiler T, Frambach DA, Seddon JM, et al. The spectrum and burden of ocular injury. Ophthalmology 1988;95:300-5. 7. Katz J, Tielsch JM. Lifetime prevalence of ocular injuries from the baltimore eye survey. Arch Ophthalmol 1993;111:1564-8. 8. Jovanovic M, Stefanovic I. Mechanical injuries of the eye: Incidence, structure and possiblilities for prevention. Br J Ophthalmol 2010;67:983-90. 9. 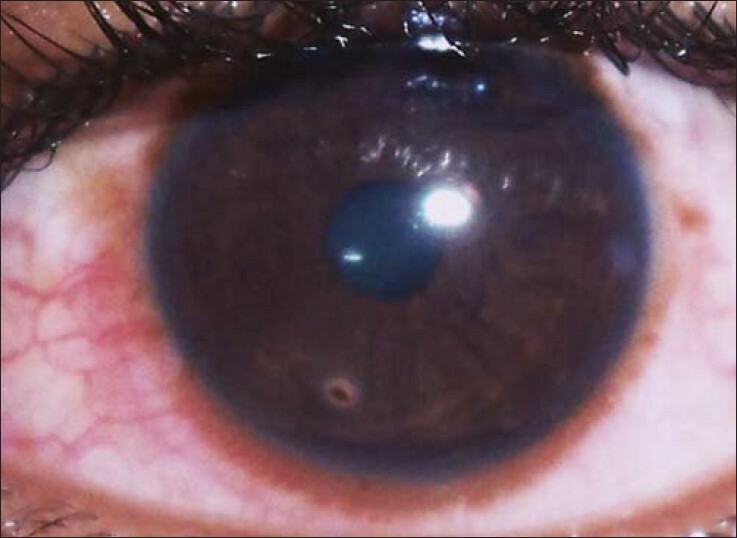 Gyasuddin S. Ocular injuries in a mountainous, rural area of Gizan, Saudi Arabia. Saudi J Ophthalmol 1993;7:106-10. 10. Thompson GJ, Mollan SP. Occupational eye injuries: A continuing problem. Occup Med 2009;59:123-5. 11. Karaman K, Gverovic-Antunica A, Rogosic V, Lakos-Krzelj V, Rozga A, Radocaj-Perko S. Epidemiology of adult eye injuries in Split-Dalmatian country. Croat Med J. 2004;45:304-9. 12. Macewen CJ. 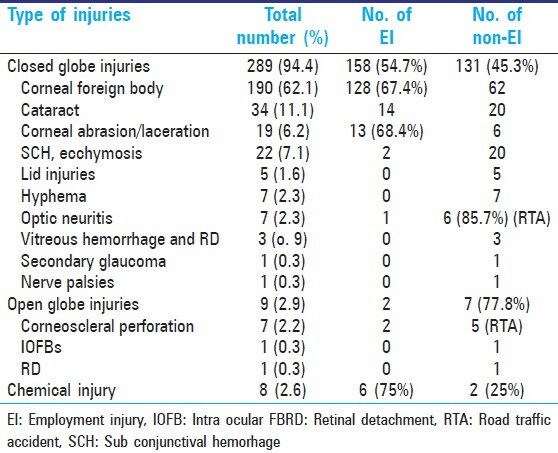 Eye injuries: A prospective survey of 5671 cases. Br J Ophthalmol 1989;73:888-94. 13. Loncarek K, Brajac I, Filipovic T, Caljkusic-Mance T, Stalekar H. Cost of treating preventable minor ocular injuries in Rijeka, Croatia. Croat Med J 2004;45:314-7. 14. Ngo CS, Leo SW. Industrial accident-related ocular emergencies in a tertiary hospital in Singapore. Singapore Med J 2008;49:280-5.